Evocative, promising teaser for a chronomancy-themed dungeon! The first installment of LPJ Design’s Infinite Dungeon clocks in at 10 pages, 1 page front cover, 1 page of editorial, 1 page of SRD, leaving us with 7 pages of content, so let’s take a look! Cusp is a small town (fully statted), situated beneath the lip of a mountainous crater that surround the eponymous Hals of the Eternal Moment. It is a little adventurer’s boomtown and also a center of chronomancy; a number of wealthy patrons control significant expenditures of gold and the city does feature several unique locations: At the pillars of watching, for example, townsfolk stand and watch foolhardy adventurers entering the complex, placing bets on whether and if so, how many, ever get out. Beyond the town, the erratic time of the complex becomes more of a problem. The city is not depicted as a vacuum, mind you – the place is rules by the survivor’s council of erstwhile adventurers that have returned from the halls and as such, are a pretty eclectic bunch. The adventurous owners of the local tavern, master chronomancer Salos Capernicus or the high-class art-dealer Theodora Hill – a total of 7 of these eclectic NPCs come with gorgeous full-color mugshot artworks…and yes, they’re original pieces. I have never seen them before. However, you should be aware that the NPC write-ups are flavor-only: Neither alignment nor build or powerlevel can be gleaned from the entries…though this is not something I’d complain about in this context. Now I mentioned the dungeon: Well, anyone entering it always returns exactly one day, one week or one month after their departure. Similarly, rapid growth and healing can be found due to the slightly accelerated flow of time, though oddly the healing properties seem to be restricted to animals. 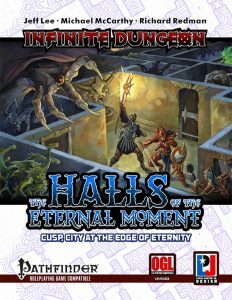 The pdf also contains a couple of ready-to-drop-in encounters: A meeting with the council, a curious time loop to interrupt and miniquests like dealing with an angry raccoon or leaf leshies on the way to the dungeon certainly whet one’s taste for more. Editing and formatting are very good, I noticed no significant glitches. Layout adheres to a drop-dead, gorgeous and yet pretty printer-friendly two-column full-color standard and the pdf sports several absolutely amazing full-color artworks, but, alas, no map of the city. The pdf comes fully bookmarked for your convenience. Jeff Lee, Rich Redman, Michael McCarthy and Louis Porter Jr. have managed to create a tantalizing pitch here. Time instability? A massive dungeon? Heck yes, the Dr. Who fanboy in me in rejoicing. The quality and set-up this provides is certainly tantalizing. Think of the puzzle-platformer Braid, the Sand of Time saga…there is a lot of amazing stuff you can do with time loops, paradox etc. and the fact that this establishes dealing with such loops in a safe environment, “explaining” by showing, makes me hopeful for the dungeon: If it can employ these tropes, this well could become the most awesome dungeon I’ve seen in ages. Alas, this is also where I am a bit concerned, for this series will stand and fall for me with the mechanical representation of the time-loops and temporal instabilities – it could be either a tool for GM-fiat or simply an amazingly creative way to provide new problem solution scenarios. The potential is immense, but this being pretty much a teaser, we get no real idea of whether the dungeon can live up to its phenomenal potential. As a teaser, this does its job well, though the lack of a town map is slightly galling. Still, this makes me very excited and hopeful about the patreon that will fund the progress of this saga. For now, my final verdict will clock in at 4.5 stars, rounded up due to the PWYW-status of this intro-booklet. Check it out and if you like it, consider supporting it – the potential is certainly here!! You can get this evocative little teaser here on OBS for any price you consider appropriate! If you like what you’re seeing, you can support this project directly here on patreon!